Indoor-outdoor living is a concept that’s becoming ever more important to homebuyers. And no matter where in the US you live or when you want to sell, you can stage your outdoor space to show buyers how they can make the most of it year-round. With so many gorgeous days on the calendar, a great outdoor space is a must on most homebuyers’ wish lists in this part of the country. But the region – which ranges from Arizona to parts of Louisiana – is challenged by extreme heat. To help buyers imagine how to beat that heat, be sure your outdoor space includes umbrellas, sail shades or another form of cover from the blazing sun. Use outdoor rugs to soften the effect of foot-searing stone surfaces underfoot, and add pops of bright color–from chair cushions to blooming flowers – to cheer up a space where the plantings or lawn have fallen victim to the heat. If your outdoor space includes a fan, turn it on to get the air moving and break up the humidity. Finally, consider adding a small water feature for pleasant background noise and to create the impression that all is not hot and dry. Hot summers and mild winters make this region – roughly from Virginia on down – a great place for outdoor living almost year-round. Capitalize on this by creating different settings to show how the home’s space can be used in a variety of ways. Almost every room inside your home can have an outdoor twin. 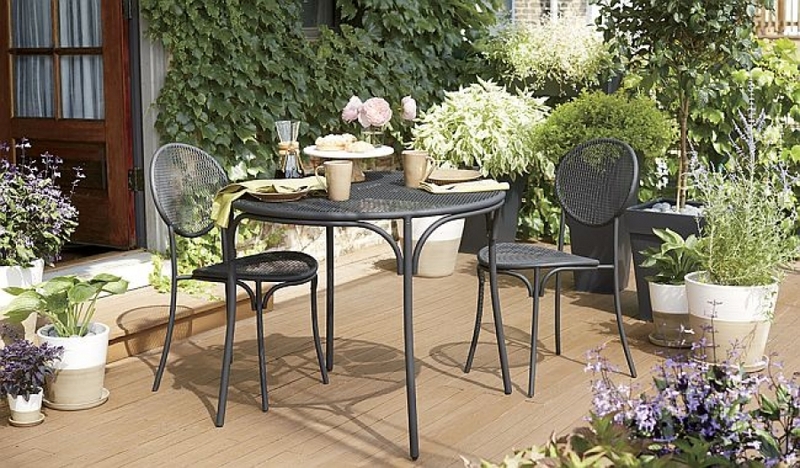 To help buyers envision al fresco family meals, set up a “dining room” on the patio or porch complete with a table, chairs, and even simple place settings with melamine dinnerware and vases of fresh flowers. In another area, arrange a few lounge chairs around a low table or fire pit to bring to mind leisurely conversations over cocktails. Pull up a chaise or two in a sunny spot, and include a side table stocked with a couple of books from the current bestseller list. If your home has a porch, turn it into a cozy nook: There’s nothing more inviting than a porch swing. Four distinct seasons – including very cold winters that necessitate a break from outdoor living–make this region an interesting place to take in what nature has to offer, from lush green springs to warm summers and brilliant, crisp falls. If you’re selling during winter, bring your outdoor furniture out of storage to show buyers how they can set up when it’s warm. Cheer up the vibe with string lights and fill planters with wintertime greenery, grasses and berries. Unused outdoor spaces can get grimy and drab in wintertime, so be sure to sweep stairs, patios and porches, dust exterior windowsills and touch up peeling fences or railings. The other three seasons allow you to show your space at its best. To prep for photos and showings, refresh your patio furniture with new cushions or outdoor throw pillows, fill your planters with blooming flowers, set up a bright, cheery umbrella to create shade, and keep the landscaping immaculately maintained. This part of the country encompasses two totally different sides of the weather spectrum, from nearly year-round perfection in California to high snowfall and frigid winters in Montana and Colorado. In the former, appeal to buyers of all ages by making your outdoor space look breezy, modern and clean in keeping with West Coast culture. Opt for streamlined furnishings and architectural planters over anything too traditional. Drape chaises with chunky blankets in natural hues to show how the space can be used on chilly nights after the sun goes down. And in states that get winter weather, be sure to include a fire pit as part of your outdoor setup. If it’s cold when you list the home, stage outdoor furniture (minus the cushions) to show how the space can be used in milder seasons, and fill planters with winter greenery for a lush look. Yes, it’s the wettest part of the country, but the region that includes Oregon and Washington lures nature lovers who dream of living among lush forests and stunning coastlines. Outdoor staging should include seating areas under umbrellas or covered porches, where homebuyers can imagine themselves snuggling up even on drizzly days. String lights go a long way toward cheering up a space in dreary conditions, and a fire pit, lanterns or heat lamps can also help warm up the vibe. Since ferns, flowers and grasses tend to thrive in this region, play up that benefit with plenty of landscaping to enliven the space. Craftsman and transitional architecture are popular in this part of the country, so choose furnishings and planters with a modern-classic look – not too sleek, not too traditional. Stage your home’s outdoor space with the same care you use inside, and buyers will have double the reason to consider making the property their own.